Sunrise Ave. remained closed by Notre Dame High School Monday afternoon due to a sinkhole. Acting Portsmouth Mayor Kevin E. Johnson said he first received word of the problem via social media Saturday night. The “problem” what was described as a fairly large sinkhole on Sunrise Avenue just south of 23rd Street near Notre Dame High School. Johnson said he quickly contacted City Manager Sam Sutherland. Both Johnson and Sutherland said by Sunday morning, the area had been cordoned off by cones and police tape. Sutherland said, just to be on the safe side, officials decided to simply close that portion of Sunrise. Johnson initially said he thought contractors might be on the scene fixing the hole by Monday morning. 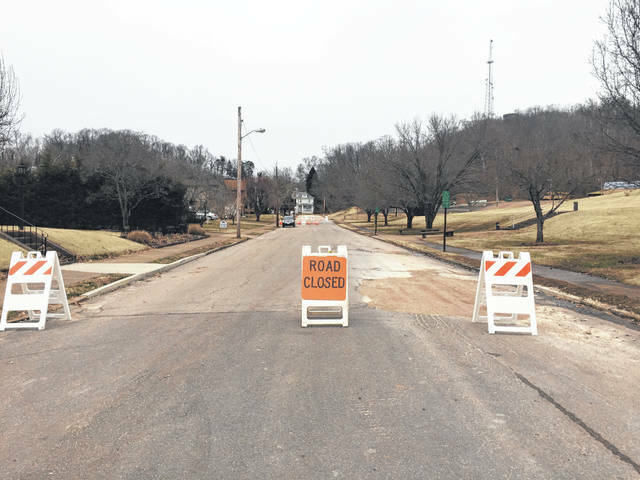 On Monday afternoon, Sutherland said city crews and officials, himself included, had made a pretty thorough inspection of the hole themselves and decided the situation could be handled in-house. He added the city was currently waiting on a check of utilities in the area as officials did not want to accidentally dig into some line or another. Sutherland added once crews get the go-ahead, he doesn’t believe, barring any unforeseen problems, cleanup of the situation should take more than a day or two. He added city workers should be able to get the hole back filled pretty quickly. Sutherland blamed the age of city sewers for indirectly leading to the sinkhole. He said bricks and mortar around a manhole cover in the immediate area of the sinkhole simply had given way. He added it’s not the first time such a situation has arisen in Portsmouth. One recent example he mentioned was a smaller sinkhole that appeared on Union Street near the tennis courts on the campus of Shawnee State University. https://www.portsmouth-dailytimes.com/wp-content/uploads/sites/28/2019/01/web1_Sink-hole.jpgSunrise Ave. remained closed by Notre Dame High School Monday afternoon due to a sinkhole.